What things are you looking for in a chimney when you go and make making an inspection chimney Chad cracks and chimney invader's cracks. Or are the issue. Does your lining crack up to your smoke shelf above your damper crack up did your damper stop working correctly. No. Are there cracks near back wall sidewalls. 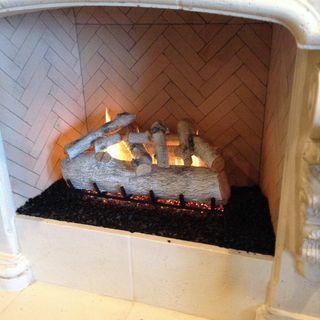 Does your Lindvall did it come loose to wear behind the opening of the fireplace that goes up through the wall. Is that sealed properly. That's some of the major parts of ... See More why you would want to have it should be inspected. Now when you say that you know the cracking of things I know there's such a thing as a chimney liner to the chimney liners end up helping out Jimmy liners. Absolutely. Parko to have a good chimney liner chimney liner can also just be realigned with mortar fire fireplace refractory. He resists and more which is the kind of which is the kind of relining that Master Services does. Okay what about chimney caps. Sometimes you notice that some people have chimney caps other people don't. Are those something that people should have. You have a prefabricated fireplace. They all have chimney caps as part of code as part of building. If you have a masonry built style chimney it is not code to have one but highly recommended because water damage is water. What causes damages to the mortar joints in the brickwork inside the fireplace flue. Now I know that the chair that you're in inv. that you came up with a new product that will help maybe revolutionize the whole fireplace industry. I invented breakdown. Great a little more decorative to the homeowner but more importantly I designed it for the chimney sweep so that he could break it down and carry in his truck and knocking it all scratched up or be hurt when he's riding in the back with van or truck. So what is the purpose of having a great great creates all the airflow underneath fire to have a good controlled fire going in your fireplace. We've all been to different places where somebody is trying to start a fire and they're dropping a few four letter words. Smoke is roll back him. Is there is there a proper way to actually get that fire lit and not have the issues of you know the smoke detectors going off like like your grandma's doing some bacon again. Well obviously there is a learning curve whenever you move into a new house or how you're going to start your fire. I mean there are people who have no gas pipes and there they have holes in it. Start the Fire with gas. I always recommend if you don't have to use a firestarter Barik they come there just little 3 or 4 inch breaks that you can put in underneath the fire or underneath the wood and light those and they'll light up the fire pretty good fairly quickly. But if you're having smoke coming out of the house that's a whole nother issue that may not have nothing to do with how you're starting your fire. Is that an issue that that master's services can help me with Chad. be having too much wood to start the fire creating too much smoke for the chimney to handle and then boom you guess its drafting well. But it's also coming into the into the house because you're having to build a fire for that firebox.